In the video, Allie talks about working with simple syrup company Root 23 and using market research to analyze competitors on the shelf next to Root 23. After considering difference such as how the different brands “talked” to customers and how ingredients were listed, The Wonder Jam chose to focus much of its efforts on the label design to make it really pop when customers saw it on the shelf. The agency recommended that the client invest in metallic ink. Within the first few months of this visual change, the simple syrups were in 10 different grocery stores. 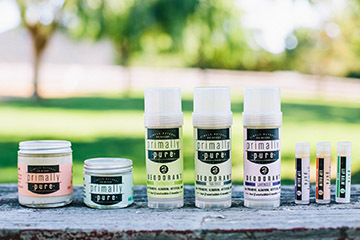 The Wonder Jam also worked with Primally Pure, which produces natural skincare products, on a rebrand. The client wanted its products to be so beautiful customers would want to leave it out on the bathroom sink rather than stash it in a cabinet. 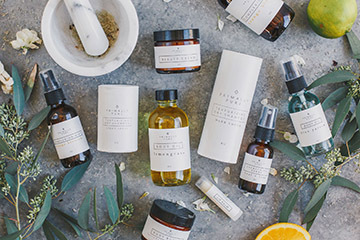 When the new brand launched, Primally Pure saw a large spike in sales but the label quality also inspired consumers to take pictures of the product and it created a lot of content for the brand and a strong conversation about the brand on social media channels. Primally Pure packaging before the rebrand. Primally Pure packaging after the rebrand.